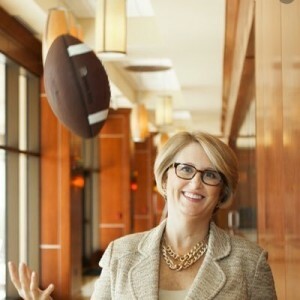 Even though Sunday’s Super Bowl 50 has long meant a packed schedule for her, NFL CIO Michelle McKenna-Doyle is happiest this week about what she and her team didn’t have to do — namely, they didn’t need to supervise any technology makeovers to Levi’s Stadium since the well-connected venue was “big game” ready from the moment it opened its doors. “This is the first Super Bowl since I’ve been here where the league didn’t have to do significant [technology] upgrades,” said McKenna-Doyle in a phone interview. In a way, McKenna-Doyle has seen the future of connected stadiums rise from the ground up, since after joining the league as its chief information officer in 2012 she was able to watch Levi’s Stadium get built, one of the first large venues where connectivity was not an afterthought. With several new NFL stadiums slated to open in the near future, McKenna-Doyle said infrastructures like Levi’s will become the rule, not the exception, as fans and the sport itself increase the need for more connectivity. But even as she talks about the future of a game-day experience that relies more heavily on mobile, digital technology, McKenna-Doyle is also trying to make sure that technology works for the benefit of all, and isn’t just there for technology’s own sake. Proof of this thinking is evident in her office’s call to remove the in-seat food delivery feature from the regular Levi’s Stadium app, instead only allowing beverages to be available for the stadium’s unique deliver-to-any-seat service. “That was our call,” said McKenna-Doyle about the decision to remove food delivery from the app. According to McKenna-Doyle, her staff monitored the service during home games for the San Francisco 49ers and saw that food delivery could at times cause “lots of foot traffic” as runners delivered orders. Putting a Super Bowl game-day app together is a bit of art, as the league tries to blend what’s available in the existing venue app with the specific Super Bowl needs. What she likes a lot about the VenueNext-built regular Levi’s Stadium app is its focus on fan services, such as parking, ticketing and wayfinding, in addition to being able to order food ahead of time for “express window” pickup. And though the Levi’s Stadium and the Super Bowl app will also support instant replay video, McKenna-Doyle thinks more app use may come from fans wanting to find out how to get around. At last year’s big game, McKenna-Doyle said that while half the fans in the stadium logged in through the game-day app, only 20 percent of that number used the app to watch replays. “Mostly, they used the app to check out what was going on,” McKenna-Doyle said. She also expects stadium-app use to be surpassed on Sunday by use of social media apps like Facebook and SnapChat, and by the inevitable Apple iOS and app updates, which happen because many fans have their devices set to run updates whenever they connect to Wi-Fi. Last year at the University of Phoenix Stadium in Glendale, Ariz., and the year before at MetLife Stadium in New Jersey, the league needed to oversee extensive Wi-Fi upgrades so that those venues would be ready for Super Bowl traffic. And even though the league still expects a jump from last year’s total of 6.23 terabytes used on Wi-Fi (a big step up from the 3.2 TB mark a year earlier), McKenna-Doyle is confident the Levi’s Stadium wireless network is ready for the game. “I was at WrestleMania and that event certainly put the network through its paces,” McKenna-Doyle said of the event that holds the Levi’s Stadium top mark for single-day Wi-Fi use, at 4.5 TB. “I think we will surpass that [total] on Sunday,” she said. From an overall league perspective, McKenna-Doyle said that with only a few stadiums without Wi-Fi (mainly those with ownership or location issues, like St. Louis and Oakland) she’s “very pleased with the progress” made over the past couple years. 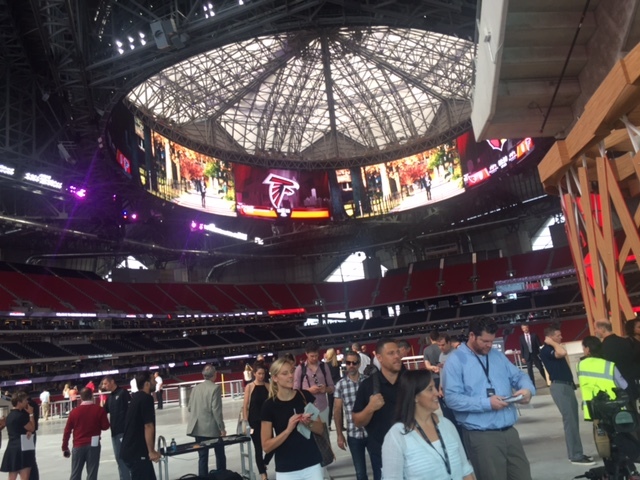 With new stadiums in Atlanta and Minnesota seeking to push the connectivity bar higher, and older stadiums getting upgrades, McKenna-Doyle said that league-wide there is full buy-in about the need for fan-facing connectivity. “We have great support from the owners, and they know that it’s not good enough to have first-generation [networks],” McKenna-Doyle said. For next year’s Super Bowl LI, it will be back to stadium Wi-Fi upgrades, as Houston’s NRG Stadium finally gets its first Wi-Fi network installed. That job (which won’t start until after this spring’s NCAA Men’s Final Four, which also takes place at NRG Stadium) may make McKenna-Doyle long for Levi’s Stadium, where good infrastructure goes beyond the fan-facing elements of the Wi-Fi, DAS and video boards inside the bowl. 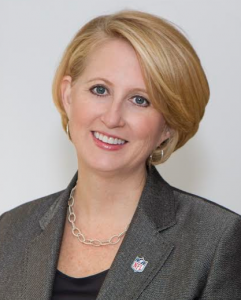 Editor’s note: the following interview with NFL CIO Michelle McKenna-Doyle was featured in our most recent long-form report, THE FOOTBALL ISSUE, which is available for free download. In addition to team-by-team capsules of technology deployments for all 32 NFL teams the issue also has several in-depth stadium technology profiles and an extensive look at the technology behind the San Francisco 49ers’ new Levi’s Stadium. Get your copy today! In a league known for its intense rivalries, is it possible to get teams to work together and share information for the betterment of all? In the area of stadium technology, that task is on the to-do list for Michelle McKenna-Doyle, who is now in her third season as chief information officer for the National Football League. In an interview with Mobile Sports Report, McKenna-Doyle outlined some of the league’s recent accomplishments in technology-related areas like instant replay and digital content, while also explaining how the league oversees stadium technology deployments. 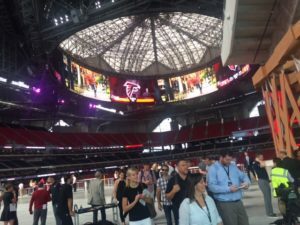 According to McKenna-Doyle, one of her office’s jobs is to act as a best-practices and lessons-learned clearinghouse, to better move the state of NFL stadium technology forward faster as a whole. Focusing on the business uses of technology and not the 1s and 0s is somewhat of a natural fit for McKenna-Doyle, who spent 13 years at the Walt Disney Company in disciplines including finance and marketing before becoming a VP in IT for two years. During CIO stints at Centex Homes and Universal Orlando Resort, McKenna-Doyle said she focused on using technology to enhance the guest experience, a goal the NFL sought when it brought her aboard in September 2012. 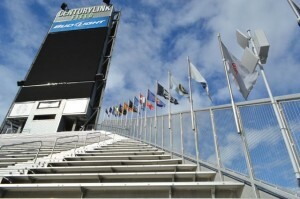 “Part of my job is making sure our in-stadium experience for mobility meets the needs of our fans,” McKenna-Doyle said. While it is true that commissioner Roger Goodell said he wanted all NFL stadiums to have fan-facing Wi-Fi, and that the league does expect teams to meet a minimum set of connectivity standards, McKenna-Doyle said the NFL’s overall stadium-tech strategy is to be more of a guide than to dictate exactly which technologies or apps teams should deploy. In the area of Wi-Fi, for example, McKenna-Doyle said that last year the league put together “a really deep-dive spec” that laid out all the basics necessary for stadium Wi-Fi deployments. “That was so teams didn’t have to start at square one for design,” McKenna-Doyle said. The league also helped move Wi-Fi deployments forward faster by signing a preferred-supplier deal with Extreme Networks, under which teams get a discount on pricing in exchange for the league-wide sponsorship exposure. (Editor’s note: This week, the league announced that Extreme is now the official Wi-Fi technology supplier for the NFL.) Though teams are not required to use Extreme’s Wi-Fi gear, new Extreme-based Wi-Fi networks are in use this season at Seattle, Jacksonville, Tennessee, and Cincinnati, joining two previous Extreme installations in Philadelphia and New England. “It’s a great option if teams choose Extreme, and it [the league deal] also creates a competitive environment for other suppliers like Cisco to step up,” McKenna-Doyle said. 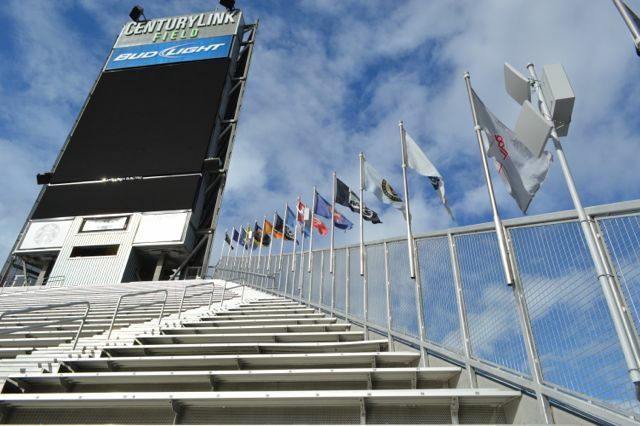 If necessary, the league can also play Wi-Fi matchmaker, as McKenna-Doyle said it did in bringing partner Verizon into Seattle, where the carrier deployed a Wi-Fi network at CenturyLink Field that is live this season. At the writing of this report, 10 of the NFL’s 32 teams still had no fan-facing Wi-Fi services at their stadiums, a list that includes Green Bay, Baltimore, Cleveland, Buffalo, Houston, Oakland, San Diego, Washington, Minnesota and St. Louis. While McKenna-Doyle said that there are “a few more Wi-Fi announcements coming,” she also noted that some teams with lease uncertanties still don’t have firm plans to deploy Wi-Fi. 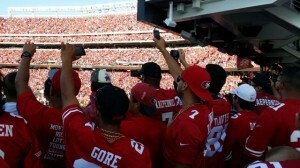 Though teams are not required to use YinzCam – the San Francisco 49ers, for example, turned to newcomer VenueNext to develop their Levi’s Stadium app – McKenna-Doyle said that YinzCam may be a fit for other teams. “For quality and speed to market, [YinzCam’s] product is very strong,” McKenna-Doyle said. Following a summer that saw her office overseeing the new method for on-field official review of replay calls – “which meant building a new system for 32 teams, 31 stadiums, and training all the officials” – as well as the launch of the NFL Now digital content site, McKenna-Doyle is back spending time with teams, counseling them on technology deployment resource management – “what to prioritize, and what to put on the back burner,” she said. That includes technology ideas that might not work operationally, like a food-ordering service that isn’t staffed properly. For the in-seat food ordering feature at Levi’s Stadium, for instance, the 49ers said they did extensive research, hiring and training to make sure they had enough feet on the ground – runners carrying orders – to make the tech-inspired feature work. If teams don’t do the human engineering behind the scenes, McKenna-Doyle said, the technology may not be that cool. Mobile Sports Report is pleased to announce the arrival of THE FOOTBALL ISSUE, our third Stadium Tech Report for 2014. As the title suggests this long-form report focuses on technology deployments at U.S. football stadiums, with an extensive inside look at the technology inside Levi’s Stadium, the new facility for the San Francisco 49ers. The report is available for free download from our site. 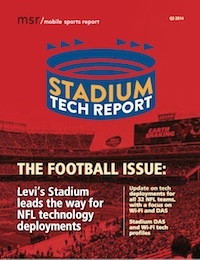 In addition to our Levi’s coverage, the Q3 issue of Stadium Tech Report also includes team-by-team reports on all 31 NFL stadiums, with a focus on Wi-Fi and DAS deployments. Our research found that while there are still 10 stadiums without fan-facing Wi-Fi, there is a lot of innovation going around league-wide, including big new digital displays in Jacksonville and Dallas, and new Wi-Fi and app deployments in other facilities. Included in the report is an exclusive MSR interview with Michelle McKenna-Doyle, the NFL’s chief information officer, who talks about how the league office acts as a guide to helping teams with their tech deployments. We also have additional insight, analysis, and more tech profiles, and the good news is it is all free to read! Simply head to our report download page and get your free copy today! We’d like to take a quick moment to thank our report sponsors, without whom we wouldn’t be able to offer such extensive original reporting and analysis free of charge. Our list for the Q3 2014 report includes SOLiD, Crown Castle, TE Connectivity, Extreme Networks, Aruba Networks, Mobilitie and DAS Group Professionals.